Dr Clara Cullen is a research associate at the School of History and Archives in UCD, and the editor of The world upturning: Elsie Henry’s Irish wartime diaries, 1913-1919 (Irish Academic Press, 2013). The diaries offer a narrative account of one woman’s personal experience during this period: while engaged in war work at home in Dublin, and concerned about relatives and friends’ fighting in France, Elsie also had connections with leading Irish nationalists, such as her aunt, Alice Stopford Green, Eoin McNeill and Roger Casement, giving her a unique insight into the events which transformed Irish society during these uniquely turbulent years. 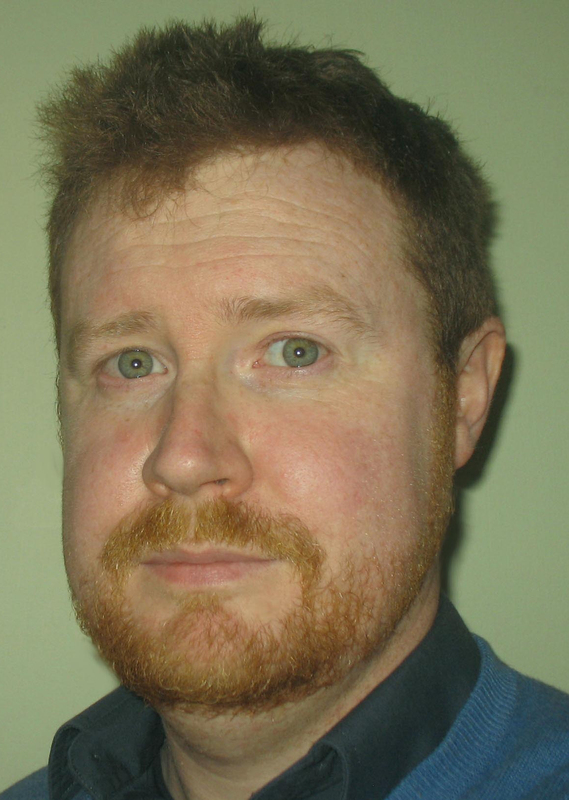 Philip Orr is an historian, lecturer and the author of a number of books and dramas dealing with the Irish experience of World War 1. 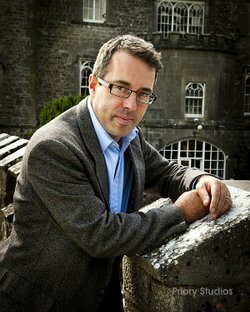 His works include Field of bones: an Irish division at Gallipoli (2006), The road to the Somme: men of the Ulster Division tell their story (updated 2nd edition 2008) and New perspectives: politics, religion and conflict in mid-Antrim, 1911-1914 (2011). 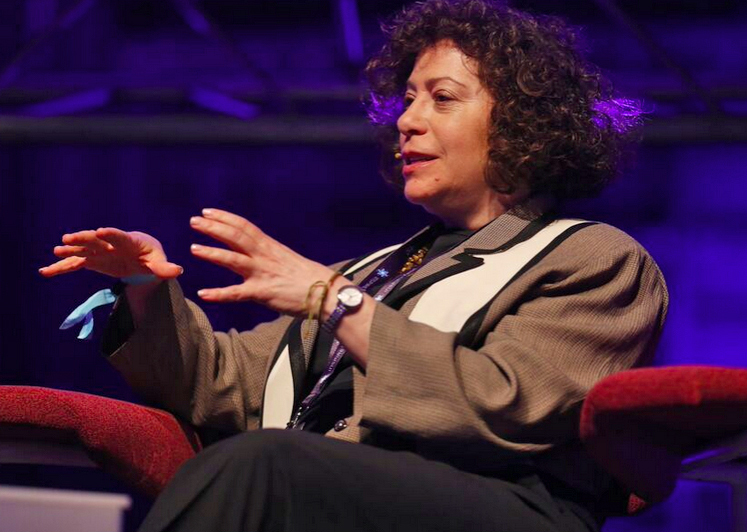 Dr Susan Schreibman is Professor of Digital Humanities and Director of An Foras Feasa at Maynooth University. She is founding editor and principal investigator of The Letters of 1916: creating history (dh.tcd.ie/letters1916/ ) Ireland’s first crowd-sourced humanities project, which is currently creating a crowd-sourced digital collection of letters written in the months before and after the Easter Rising (1 November 1915-31 October 1916). – Tales of the Irish and the Great War (2014). 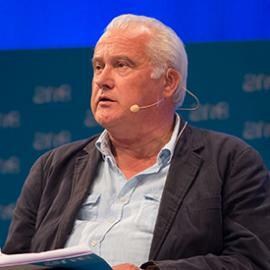 John Bruton was born in 1947 and graduated from University College Dublin with a Bachelor of Arts degree in economics and politics in 1968, before studying to become a barrister. He was called to the Bar of Ireland in 1972. He holds Honorary Degrees from Memorial University of Newfoundland and the National University of Ireland. 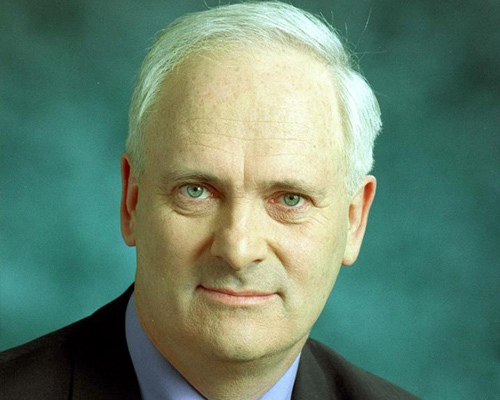 John Bruton is a former Taoiseach - 1994-1997. He was deeply involved in the Northern Irish Peace Process, leading to the 1998 Good Friday Agreement, under whose terms a conflict of allegiances dating back to the seventeenth century was resolved. Eva O’Hara is from Greystones. As a transition year student at Loreto Secondary School in Bray, Eva was the winner of an essay competition which entitled her to represent Wicklow in the all-Ireland My Adopted Soldier project (www.myadoptedsoldier.com/archive.php ). 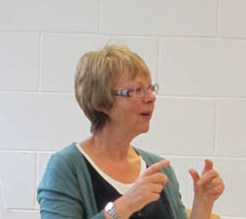 As her contribution to the project, she has chosen to research the life of Greystones soldier James Joseph Lawless, and has visited the Somme battlefields where he died and the Thiepval Memorial on which he is commemorated. Friday evening started with a celebration of Greystones and Ards connection was well received by a large audience with follow on lectures by Lord Meath , Deputy Anne Ferris and the Key note address from the leader of the WW1 Road show Myles Dungun. Saturday included more personal reflections from Chris Fox and WW1 Roadshow members Brendan Flynn, John O’Keeffe and Dr Ciaran Wallace. Over 40 people took part in a walking tour of historic Greystones lead by Rosemary Raughter and Joan Jones. The final event on Saturday was the Seminar Dinner which was addressed by Minister of State Deputy Simon Harris, the Bray Concert Band under the leadership of Gerry Stafford proved a musical favour of World War 1 . The final Jim Brennan memorial Lecture was given by Turtle Bunbury on Sunday morning. George Jones thanked the community for buying tickets for the event (normally it was a free event but with the changes to Local Government new funding arrangements were needed) and also praised the support of local councillors Tom Fortune , Grainne McLoughlin, Derek Mitchell, and Gerry Walsh, for the weekend along with support from Deputies Ferris, Harris, Timmins and Doyle. George Jones welcomed the great support from Northern Ireland Councillors and in particular was delighted that Baroness Nuala O’Loan was in attendance with her husband Councillor Declan O’Loan from Ballymena Borough Council , Councillors were also present from Ards, Omagh, Newry & Mourne, Castlereagh, George Jones also thanked Wicklow County Councillors Pat Casey, Shay Cullen, Pat Vance, John Ryan, Chris Fox, Vincent Blake and Edward Timmins for attending over the weekend. 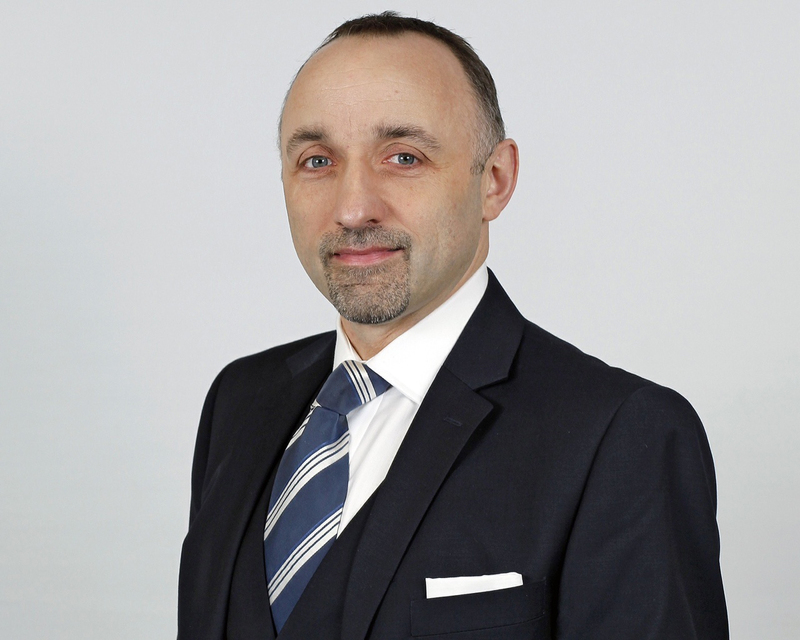 George Jones concluded “ the very large attendance over the weekend really shows that there is a great interest in history and events and the Legacy in association with GAHS look forward to providing a further interesting 27th Seminar in 2015. 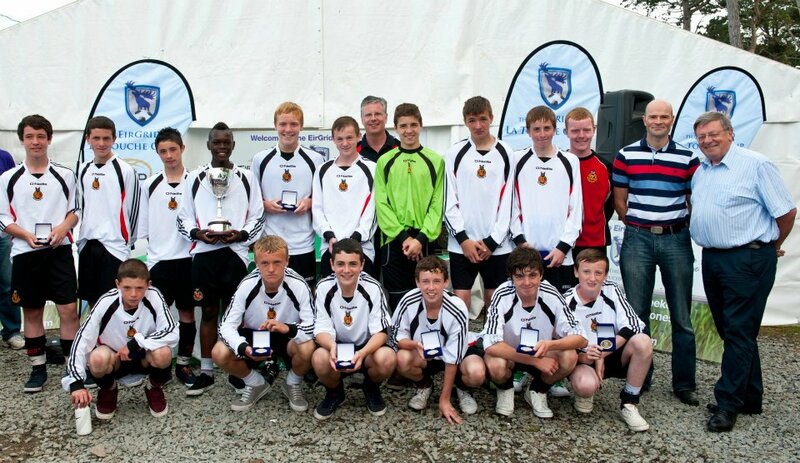 Pictures from the weekend can be viewed here. This week (6th September) details were released of the La Touche Family Gathering that will take place in conjunction with the 25th La Touche Legacy Seminar. 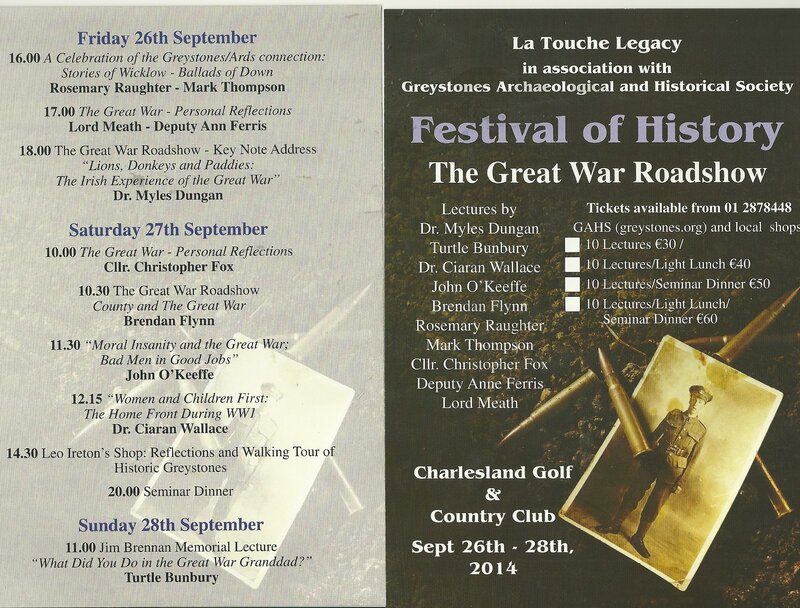 The Chairman of the La Touche Legacy Committee Cllr George Jones said he was delighted that up to 40 members of the La Touche Family are taking part in “A Gathering Event” from September 24th –September 29th. Family members from America, England and of course Ireland are attending a series of events organised by the Greystones based La Touche Legacy Committee. “They will visit Luggala House the home of The Hon Garech Brown (again the hunting lodge of the La Touches), Glendalough, Christ ChurchDelgany, Bellevue Estate and Greystones Library to unveil a plaque to honour the visit in La Touche Heritage Centre.” The group have also accepted the invitation of Sir Charles Colthurst Blarney Castle (himself a La Touche) to visit where they will be joined by the former Abbot of Glenstal Dom Christopher Dillon (another family member). Jim Power Economist, Brendan Keenan Group Business Editor Independent Newspapers, Frank McDonald Irish Times, Anne O’Keeffe Former Director OLAM, Tom Dowling Former County Manager, Mike Nesbitt MLA Leader of the Ulster Unionist Party and Chris Corlett Archaeologist. 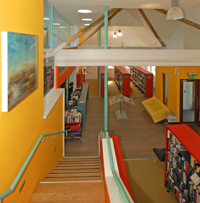 At an event in the Greystones Library on Saturday 7th July the Chairman of the La Touche Legacy Committee Cllr George Jones announced the winners of the photography competition recently run by the Legacy. Cllr Jones thanked all who submitted entries over a 150 photos for the competition and in particular praised Committee member Pat Killilea for all the organisation of the final stages of the competition. Cllr Jones indicated that all entries were judged by a IPF member from outside the area and a sample of the entries are on display in the Library for the next week. The 23rd Annual La Touche Legacy Conference was heralded as an outstanding success. Last years conference held from the 30th September to the 2nd October has been recognised as an outstanding success with a wide range of speakers and topics covered to discuss this years theme - Local Democracy - A Vision for the Future. The book represents a major research effort on the part of the author, Michael McGinley. 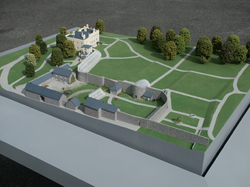 The main narrative traces the history of the great Irish Huguenot family, from its antecedents in France through its "golden era" in Ireland, a period which lasted 150 years from the arrival in 1689 of David Digues la Touche to fight for King William at the Boyne.